New Orleans will forever remain an anomaly to me, as it is one of the most religious and seemingly secular places I’ve ever visited. Walking through the streets around 10AM looking for breakfast, the smell of alcohol still reeked from bars. The cafes that seemed to all close by 8pm were so weird for me, the girl who was used to having 24 hour Starbucks around the corner. With that being said I am so grateful to have had the opportunity to go on this trip, and learned so much more about myself than I thought possible in a little under twelve days. Most of my life has been spent living somewhat sheltered and it was such an odd experience for me to be exposed to so much in under such a short amount of time. This trip made me constantly think of something called “The Candle Experiment”. Participants are asked to find a way to get a candle to burn without dripping on a table. The candle is not allowed to stand on the table and the participant is given a candle, box of matches and a box of pins. It’s not until the participant dumps all of the pins out of the box, pins this box against the wall and has the candle stand lit up on the empty box that he or she completes the challenge. They must learn to think of a box of pins as more than a box of pins. Something that is seemingly easy to do, but when we assign something a role in our lives, it’s hard to “un-think” things. Ironically enough, New Orleans did that for me and this response paper will attempt to explain why and how this happened. The disaster of Katrina was not real to me until I came to New Orleans. The value of my education didn’t make sense until we visited a charter school in the ninth ward. If there is anything in this city that evidences how great a devastation Katrina was, this school fits the bill. Granted, the schools were bad before the storm, but a bad situation was made even worse. Trailers that housed students instead of a solid building greeted us. It was called George Washington Carver High School and we went here because previous alumnus were working there with “Teach for America”. Our group made our way past the metal detectors into the school itself. There never seemed to be a need for metal detectors where I grew up but there was a need for it there. The classrooms were so small and it was weird for me to see students so unengaged. I wasn’t used to that kind of environment. I was used to quite classroom filled with people who were afraid to call out. There was no such sense of fear at this school. No one seemed to care about being in school and the classes that ran best were run like a military academy. I didn’t want to believe that learning was meant to happen in this way. To me education was something I learned to love, it was engaging, captivating and most of all it challenged me. I was saddened by a generation of teenagers and children who were essentially test guineas. There lives would be messed up so that later on, the administration could learn from past mistakes. I work as a communications tutor and I’ve been told time and time again that formulas work. Students learn when they are told exactly what to do. I refused to believe such logic and wanted to believe that you learned to write from reading and that you loved learning because it was fun. Going to this school reaffirmed so many thoughts I had previously refused to accept. These students needed this structure, they needed these rules and they needed a lack of freedom for them to actually do well. Working at “Grow dat” was such a weird experience for me because I had never done anything like weeding for hours before. It was weird to transition from their “tourist” like view of New Orleans into someone who was doing hard manual work. Weeding required a strange sense of diligence I doubt I would have tolerated had it not been required. We started our days weeding, and we ended our days weeding. There’s this strange bond that is formed between people when you are united over a common goal. We worked together because we needed to finish weeding a “bed” and did not stop until this was accomplished, or lunchtime was called. I never imagined I would be spending my spring break singing songs weeding hour after hour; but in doing so I learned more than I thought possible. When you weed, it’s not enough to simply pull out the weed. You need to pull out the root and throw your weed in a bucket. We learned to work together and to weed in pairs. This was a program offered to the youth of New Orleans and knowing this was around made me happy. After seeing how little opportunities so many teenagers seemed to have in their education system, it was nice to see they could learn and grow here. 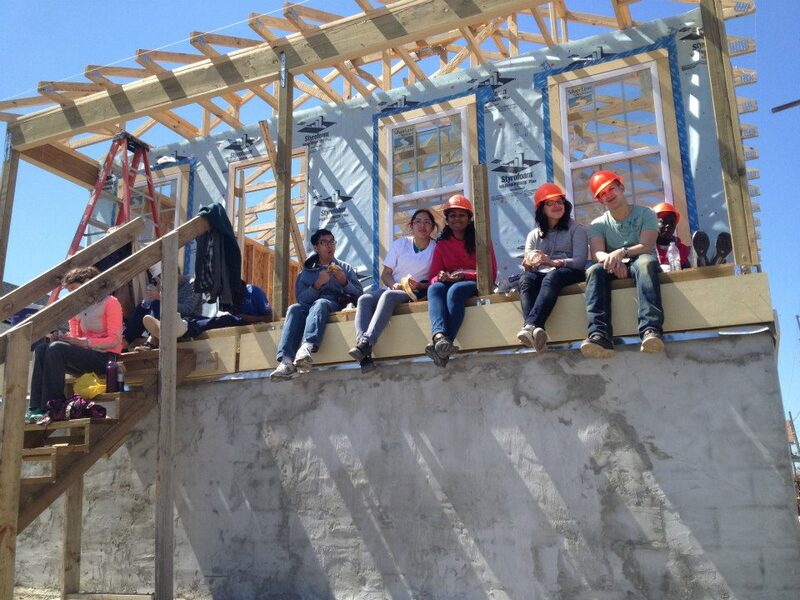 Working at “Habitat for Humanity” taught me the valuing of doing things, even if I’m not initially good at them. This was different from “Grow Dat” because weeding was not particularly difficult to me, it was more so tiring than anything else. Doing construction work was something that I’ve never experienced before and was definitely not a natural at. I’ve always considered myself an academic, or at least I’ve been an academic for a long portion of my life. I don’t go outside and play sports. I sit inside and I read novel after novel. I like talking about problems that seem important and voicing my opinion. Working with “Habitat for Humanity” taught me that just because I wasn’t good at “hammering” and “cocking” initially, didn’t mean this was a skill I could one day acquire. I remember being so afraid coming into the house. I was afraid to walk up the seemingly unstable stairs, and while I was attempting to quietly overcome this fear I was expected to bring up a huge ladder using this same set of stairs! My work started by me refusing to stand on a ladder, but I grew to become good friends with people from my group and I was pushed out of my comfort zone. By the end of my trip, I was relaxing and sitting comfortably on a ladder while hammering away. I was hammering very slowly, but I was still hammering away. That counts for something, doesn’t it? I realize it may sound small, but doing that was really hard for me. And I doubt I would have pushed myself if I didn’t have to. Going on tours and seeing the results of history before my eyes was such a weird experience for me. Going in front of the school that was the first to say “separate but equal” was not actually equal gave me chills all along my body. I was standing on a piece of history that influenced countless lives. It was weird for me to imagine a time and place where I wouldn’t be accepted because of my race. It was even weirder to be standing on the very ground this event happened. We went to a graveyard and were told that across from where we were standing was a place that once held the only legal prostitution in the country. The way this was explained to us was that prostitution was not legalized here, it was just that all the surrounding areas had a clear ban on prostitution. I was so disgusted and so shocked to see what this place now become. Children were running around and I doubt they knew what the ground they were standing on was once known for. Visiting the levees astounded me; I could not believe that something so large could be constructed so poorly. What really hurt me the most was seeing a house abandoned that was in front of a poorly made levy. Houses were marked with an “x” to let people know if bodies were found inside. At one point in time someone lived in that house and now it was abandoned and broken. Entire levees were rendered useless because the city ran out of funding to cover the entire area. Levees were constructed with poor engineering because constructing those types of levees saved money. The example that was explained to us were “T” levees that technically did the job and saved money. In reality they didn’t work efficiently when a disaster like Hurricane Katrina hit New Orleans. What astounded me most of all was that some home owners didn’t want levees put in their backyard because they believed that they were eye sores. Safety did not matter because people were more concerned with how their backyards look like. Knowing the severity of Hurricane Katrina and the impact it had, I couldn’t believe that people were more concerned with aesthetics than safety for them and people who lived near them as well. New Orleans is a city that is being reborn into something amazing. There’s such a flush and melting pot of different cultures that makes me feel so welcome, yet so un-welcome at the same time. More than anything New Orleans taught me so much more about myself than I ever thought possible. All of my life I’ve struggled to find a balance with religion in my life. I’ve imagined that my “candle problem” involved me hiding my religiousness while still trying to show who I am. New Orleans taught me that this was something I never needed to do at all. New Orleans is a city that waits for no one. It’s weird and it likes being weird. It’s a city filled with people who are proud of who they are. You walk down the cobblestone streets and are met by music from musicians who love what they do. I needed to learn that my religion was more than just my religion, it was who I was and it defined me. My box of pins was meant for more than to just hold pins, it was meant to solve a seemingly unsolvable situation. This city taught me to feel the same about myself and who I am as a human being. I’m forever indebted to it for that very reason.